To sit on a porch in the tiny mountain town of Cerro Azul is to experience true serenity. That’s how I feel as I relax in an old Adirondack-style chair, gazing at hillsides carpeted in green. A single pick-up truck is the only vehicle that trundles past. Though I don’t know him, the driver gives me a friendly wave. Earlier in the day I took a mini-hike to a hilltop mirador (lookout point) and caught far-off glimpses of both the Pacific and the Caribbean. Now I sit sipping my coffee and watching a pretty blue tanager swoop around the garden. Cerro Azul boasts breathtaking views from just about any vantage point. In the distance are Panama City‘s shiny towers, just an hour’s drive away. But I can’t hear any traffic or see any smog. The air is crisp and cool and as clean as can be. The town and the adjacent Chagres National Park are filled with rivers and streams that sustain some of the world’s most beautiful birds, plants, and more. You’ll see many a cottage here with feeders and flowers planted specifically to attract jewel-bright hummingbirds. 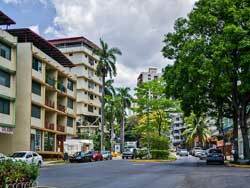 The best properties are within the gates of Altos del Cerro Azul, an older, tree-filled community with a clubhouse/restaurant, a pool, tennis courts, and a few small shops. Though there’s little else here, Cerro Azul has all the basics, including cell phone, cable television, and internet service. Residents zip into Panama City a few times a week to visit malls, hospitals, movie theaters, art galleries, and more. The city’s scintillating nightlife is a stark contrast to Cerro Azul, where the lack of light pollution makes the stars seem extra bright. It reminds me of being at the planetarium as a kid. Cerro Azul offers expats a relaxed lifestyle surrounded by nature and wildlife. Evenings in this mountain hamlet are quiet, with social activities consisting of dinner or drinks at a friend’s place. Daytime may bring a casual lunch at the clubhouse, followed by a game of tennis or dip at the pool. There’s a small community of expats that live here full time—just over 100 households, I’d say. Well-heeled Panamanians own homes here, as well. Most work in the city and come up on weekends and holidays to enjoy the cool mountain air. 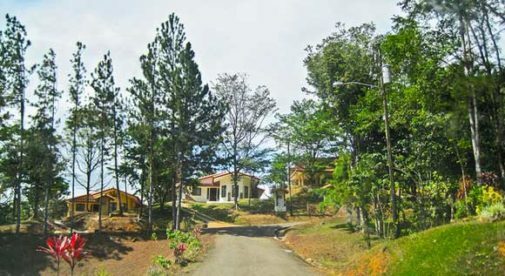 In Altos del Cerro Azul a basic one-bedroom, one-bathroom cottage is on offer for $80,000. The two-level home is close to the community clubhouse, on a road lined with tall pines. Total construction is about 1,000 square feet and the lot is nearly a quarter acre. A more upscale home just went down in price from about $140,000 to $120,000. With three bedrooms and two bathrooms, the Swiss-style house features massive windows that overlook a lot filled with bougainvillea and an array of plants, ferns, and flowering trees. The sale price includes furniture. You’ll find plenty more to choose from here in the under-$200,000 range…homes of all sizes, with lots of nearly a quarter acre or more. One chalet listed at $161,000 is about 2,700 square feet in size, with four bedrooms, three-and-a-half bathrooms, a large patio, and covered carport. No matter where you are in Cerro Azul, you’re near hiking trails and surrounded by trees and flowers. There are expats and locals living here who wouldn’t trade the cool weather and expansive views for anything. It’s the very antithesis of rat-race living. Instead of traffic-clogged streets lined with fast food joints and strip malls, you have meandering lanes lined with evergreens and gabled cottages. There are never any stressed-out executives rushing past. Rather, daily encounters are with happy hikers, horses, sloths, monkeys, agoutis, and of course, colorful birds. It’s a place to slow down, sit on the porch, and enjoy that thing we call serenity.